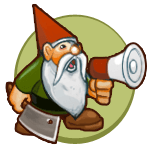 Hey, do you want to get Gnome Stew articles delivered to you? Of course you do, don’t be ridiculous. There are two great ways to get our articles delivered to you! Subscribe to our RSS feed. Yeah, those are still a thing.